I like opinions because we all have them, that said, I am ready to watch this drama because I like shorter dramas and I loved Lee Jin Wook in nine days, Jung Hae In caught my attention in Bride of the Century and lastly I find Yang Dong Geun a most puzzling actor. I have watched several of his works and keep getting drawn in. Yong Hwa will not be the draw for me in this drama, although it will give him the opportunity to expand his acting career. To see Yonghwa doing a period drama at tvN is a wish come true. Don’t care if he’s the lead or not. All I care about is for this drama to be successful and well received by the viewers, and Yonghwa to get positive reviews. Agree with @Fullheart5. Yong Hwa doesn’t have enough acting experience to be the lead. But the other three actually knows what they’re doing and so far they’ve shown their acting skill succcessfully in other dramas! If Yong Hwa is the lead of this drama then I don’t want to watch it. The rest of the cast are better actors than him. hhmm….i cant wait to see this dramabut i think its too short its only12 ep…. hhmm….i cant wait to see this drama but i think its too short its only12 ep…. lm in luv with Korean movies,,,l cant wait fo this 1! I am watching this series for Yong Hwa only! …go go Yong Hwa! looking forward to this series! I’m curious to discover the Korean Verision, that will be wired for me…as this story is soo famous….and been adapted to TV drama and films many times…. So excited coz of Yonghwa and also this is Yonghwa’s first historical drama. Can’t wait! Fighting Yong! 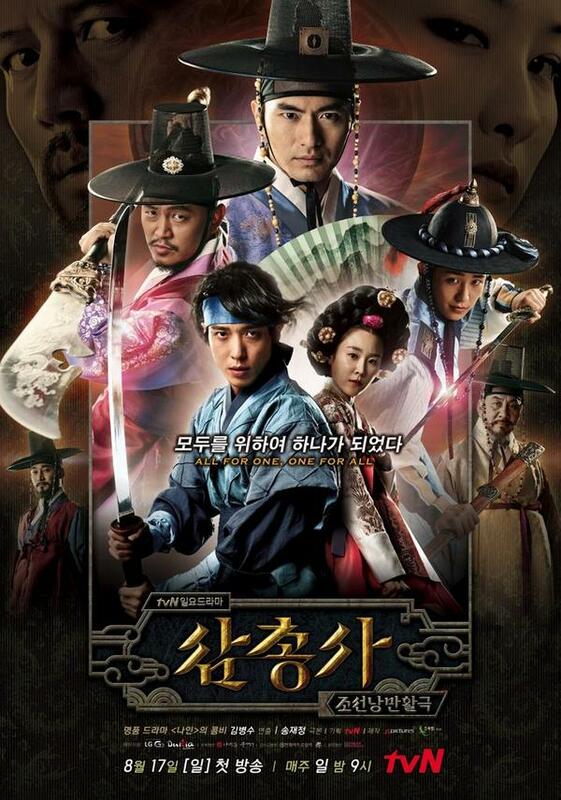 Im really excited to watch Yonghwa’s period drama! Park Dal Hyang fighting! Excited to the max… wanna see the transformation of Jung YongHwa from Rock Star to Action Star. omo…. cant wait…. yong hwa…. So excited to watch three musketeers! when would it air in the US ? i always like watching this genre, but will not compare with the western made movies to be fair. am sure the korean version will hold up to par, if not better. You can watch The Three Musketeers here. It’s licensed and runs as a simulcast. So every Sunday an episode will be “aired”. It is not licensed for viewers in the USA on Viki’s site (unfortunately). Really liked the first episode. Only complaint was the fake horseback riding for closeups. Otherwise, no complaints. Oh! And the mishap at the end of the first episode, how funny. jyh has grown from ‘you’re beautiful’ and ‘heartstrings’! looks like he trained a lot for this role. first episode interesting so far, looking forward to future episodes. Viki did not get the license for the US. Is there anywhere else we can watch it? 1st episode daebak, i like the story so funny and not boring congrats, i love you more Yonghwa! Yonghwa is so cute in this drama! Ep1 is so good, love the anime thing (moon effect while PDH practicing the martial art). I like how fast the pacing of the story you won’t feel bored. The innocent look of PDH and mischievous character of the Crown Prince. Even the cinematography so cool. YongHwa is an ACE in “Running Man” , and he prove it here while doing the actions scenes. I love the daebak introduction where JYH is doing the solo sword choreography in that setting and that lighting. I enjoyed the characters and it has a storyline with some action, comedy, intrigue, romance, history….something for everyone! YongHwa’s acting has definitely improved and he appears to be more natural and comfortable possibly because the role is different, challenging and more suited for him and his personality. I look forward to more fun interaction between him and the Crown Prince as their facial expressions, speak volumes. Kudos for good casting of the main characters. I’m one of his oldest but none the less, very big fan of Yong Hwa and CNBLUE. In January, I flew from Hawaii to California and spent less than two days there just to attend CNBLUE’s Pasadena concert. I prefer a more intimate venue so instead of flying to Korea or Japan, I waited for their world tour performance in the US. I do hope they’ll allow Yong Hwa to compose and/or sing a song for the sound track as he is truly a multi-talented, adorable and charming SuperStar!! Possibly, this series may not end up as big a hit in Korea but it will definitely have world-wide appeal! Manse!! I look forward to more of the writer’s adaptation of the Musketeer’s adventures and misadventures!! Pls make it twice a week! This drama is showing in the USA on KDrama. So far the episode 1 is interesting. @grace: i agree with you, they should have two episodes per week! i like this drama, no roundabouts! question who’s Park Dal Hyang’s partner??? This must be a daebak! OMG ep 3 is the best acting for YongHwa…please eng sub come faster. Waiting for Ep 4 bare back of PDH and hmm Mir Yeong seducing PDH. cant wait for ep 4..
EP 4 …a split second of bare back of YongHwa but definitely the precious one. YongHwa’s eyes ,nose and lips got to be OMG sory can’t concentrate on the story….Hmm a clear shot of his eye mole. i watch this show because of yonghwa. and he seems improved his acting skill a lot. no regret watching him casted as PDH. however, as the story goes by… I’M ROOTED FOR CROWN PRINCE x PRINCESS. especially, Crown Princess. she is hilarious and cuuute. I smell GOONG a little, where the Crown Prince starts to fall for Crown Princess little by litte. in fact i started watching this drama because of jyh.but now i like all the characters.non of them is boring.specially crown princess is really more than expectations.really cute. JYH improved a lot!great crying.great fighting and great nervousness! After watching ep. 1, 2, 3 and 4, all I can say is that it just gets better and better. I, too, wish it played more than once a week. I especially enjoy the twists and turns and development of each character. Love to see the behind the scene filming and the NG’s as the actors are so into their roles that they must be having a lot of fun off camera, too! Everyone, please take care of Yonghwa. I can tell from his aura that he has such a soul. so cute and cool drama..i cant wait watch next ep..
ep. 7: i like the writing of how the turn of events turned near disaster into a resolution of two problems. good show! For me ep 7 is the best…and cheeky PDH is on the go..
really amazed with the storyline,actor and the actress really nailed it,i cant wait till next week for the new episode…..
really i like ep 7 .. good show ! ohhhh, i so look forward to next week’s episode! This is a superb drama with a storyline that attracks viewers’ attention. Congratulations to the actors and actresses, and of course the writer and the team that allow us to enjoy a good drama. Love the crown couple…cant wait for the next ep..but still i love yonghwa the best…. Yes. I agreed with you Torri…feel so down after watched the preview. So much feels in ep 11!!! It’s like I can’t be truly happy coz PDH’s dad is dead but then that breathtakingly long kiss and cute short kiss!!! we’ll see what the last episode brings. happy one? I hope the princess remain in Season 2. It ended with a nice twist…ANYWAY … to all the actors, staff and crew…you work hard..WAITING FOR THE SEASON 2… Gonna miss Park Dalhyang. i really like season 1, no unnecessary scenes which could have distract and bore me. it was great, and the last episode has prelude for season 2 which i look forward to. when will it be? it’s an excellent watch! correction…which could have distracted and bored me…..
j’ai adorée cette série, des acteurs excellent vivement la saison 2. Season 1 was fabulous! Looking forward to season 2! @tigerb The start of shooting for Season 2 will be on January and the cast will be the same. It will be more on CP and CPs blooming romance, revenge of Miryeong and PDH romance with Tani. But I wish the grown up Tani will be a different actress…Waiting for Season 2. @tigerb: Per KBoice (Korean CN Blue fan club) In Season 2 the film production is aiming to have a 2 epi per week and will start broadcasting on the first week of March. Season 3 will immediately follow and August is the schedule to end filming. @angel0808: thank you, thank you, thank you! ohh, so glad that the succeeding seasons will air faster than i thought, and two episodes per week!!! hurray! something to look forward to in 2015! cheers! Ceritanya menarik, Yong Hwa di sini keren banget… Cepetan donk bikin sesion 2 nya… Gak sabar nih. Pake hrus ada sesion 2 & sesion 3 sgala, knp ga dilangsungin aja sampe bbrp episode ky Empress Ki, Jung ok Jang, Joseon Gunman, The Night Wacthman or drama sageuk lain nya… Why…? FYI, TTM having Season 2 and 3 because YH is super busy they made a schedule that will fit him the filming.He need to take a break for the CB concerts, Solo album and other activities (commercial etc). He didn’t attend the WRAP UP of TTM because he directly fly to Sydney for CF. i like this drama. . . I like romantic story between Crown Prince and Princess. it’s funny & refreshing. season 2 please……..
Oh my god… Need to wait till March for Season 2!?? ARgh… Cant they air it faster? Very good KD! Applause to the cast and crew of the drama. The writer is good as well as the line producer. Great chemistry among the actors. Very well directed. I can’t help to check out the history, sad to know what happened to the Crown Prince and his family but the writer of this drama is really really good. Seo Hyun Jin is really a discovery. I started to like her in the Kings Daughter. That KD is a great historical drama of 2013 and this one for 2014! I’m dying for Season 2. I am happy to know from some of the commentaries i just read that seasons 2 and 3 will be aired sometime this year…i am so looking forward to them…what an amazing drama…great script, great acting, great set design, and great costumes(it must have cost a lot)…Well done to the whole crew of Three Musketeers! Can not wait til the next session. I just finished watching the 12 episodes..and i loved it a lot..and the last episode makes me hyper because of the fact that there’s still the next season /episode to watch out for..i really really admire the cast,.you captured my heart, you are all so great..i’m hoping to see and watch again the next episodes.although i saw some articles saying that the season 2&3 were cancelled, i’m still waiting, hoping and praying that it will be aired again soon..i’m from Philippines and i REALLY LOVE THE THREE MUSKETEERS. PLEASE DON’T MAKE US, THE VIEWERS OUTSIDE YOUR COUNTRY FEEL DISAPPOINTED.WE ALL WANT THE CONTINUATION OF THE SHOW..THANK YOU GODBLESS!! We are actually waiting, please do not change the Princess, she is such a good actress, even in the Kings daughter she was herself. Still waiting for season 2 and 3 with same cast of actors!! Jung Yong Hwa is in the army. I think that’s why the story do not continue. Also too bad the rating of the 1st season is not that good. I do hope they will make season 2 and 3 with the same cast.